September 3, 2013 - A federal court ruled on Wednesday that constitutional rights are at stake when the government places Americans on the No Fly List, agreeing with the plaintiffs in a lawsuit filed by the American Civil Liberties Union. The suit challenges the process for attempting to get off the list as unfair, inadequate, and unconstitutional. The decision also asked the ACLU and the government to submit additional information about the No Fly List redress procedure in order to help the court decide the ultimate question of whether it satisfies the Fifth Amendment's guarantee of due process. "This decision is a critically important step towards vindicating the due process rights of Americans on the No Fly List," said ACLU Staff Attorney Nusrat Choudhury, one of the attorneys who argued the case in June. "For the first time, a federal court has recognized that when the government bans Americans from flying and smears them as suspected terrorists, it deprives them of constitutionally protected liberties, and they must have a fair process to clear their names. The No Fly List procedures violate due process because the government refuses to provide any explanation or a hearing for innocent Americans to challenge their inclusion, and we look forward to making that case to the court." The national ACLU, along with its affiliates in Oregon, Southern California, Northern California, and New Mexico, filed the lawsuit in June 2010. It represents 13 U.S. citizens, including four military veterans, who are on the No Fly List and banned from flying to or from the U.S. or over American airspace. In July 2012, the 9th Circuit Appeals Court reversed the district court's dismissal of the case on jurisdictional grounds, and now the district court is considering the case on its merits. In Wednesday’s ruling, U.S. District Judge Anna J. Brown wrote, "Although there are perhaps viable alternatives to flying for domestic travel within the continental United States such as traveling by car or train, the Court disagrees with Defendants’ contention that international air travel is a mere convenience in light of the realities of our modern world. “Such an argument ignores the numerous reasons an individual may have for wanting or needing to travel overseas quickly such as for the birth of a child, the death of a loved one, a business opportunity, or a religious obligation… the Court concludes on this record that Plaintiffs have a constitutionally-protected liberty interest in traveling internationally by air, which is affected by being placed on the list." Plaintiff Abe Mashal, a U.S. Marine Corps veteran and dog trainer, has lost the business of clients located outside of driving distance from his home in Illinois, and he was unable to travel to Hawaii for his sister-in-law's graduation. "Putting me on a blacklist without telling me why or giving me a chance to clear my name is fundamentally unfair," Mashal said. "I've done nothing wrong, yet the government is putting me through great personal and financial hardship." According to media reports, there are more than 20,000 people on the No Fly List. Their only recourse is to file a request with the Department of Homeland Security's "Traveler Redress Inquiry Program," after which DHS responds with a letter that does not explain why they were denied boarding. The letter does not confirm or deny whether their names remain on the No Fly List, and does not indicate whether they can fly. 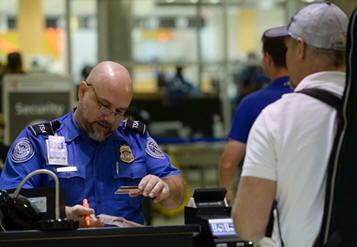 The only way for a person to find out if his or her name was removed from the No Fly List is to buy a plane ticket, go to the airport, see if he or she can get on the flight – taking the risk of being denied boarding and marked as a suspected terrorist, and losing the cost of the airline ticket. The ACLU argues that this system violates the Fifth Amendment's requirement that the government cannot deprive a person of liberty "without due process of law."